Denny Jump (Bellevue, WA, United States) on 27 September 2011 in Landscape & Rural and Portfolio. Although our weather, of late ,is nothing but "autumny," I captured this shot a few weeks ago when it actually WAS starting to look like autumn had finally begun...cool mornings, misty fields. But then, the heat and humidity returned....Hopefully, this will inspire the weather gods to return autumn to our midst. @Chris Pereira: Thanks very much, Chris..I loved that tree too...and I really did not notice it that much until I was working with everything on my iMac at home..then it really came out..Thanks very much I am loving your work sir!! gorgeous light!!! a wonderful scenery!!! great image Denny!!! Undoubtedly the best photograph on Aminus today, better than Don or Scott's and that is truly saying something as they are the masters! Denny, the light, the composition, everything is perfect. I would pay money for this photo. @Richard: Sold!! $3.95 USD and a Free Night in the Barn and you're on... Seriously thank you Richard , I just woke up and getting ready to leave for work, so this is really nice to see. Thanks good friend!! @Ralf Kesper: Ho Ralf..Thannk you very, very much sir!! This is absolutely wonderful shot. 5 stars. @k@: Thank you so much, Karine...and this being September, the vision, when I took this shot reminded me so deeply of thet great song that they do: "September". Thank you so much Karine ;-) "Do you remember, The 21st night of September? Love was changing the minds of pretenders While chasing the clouds away....Our hearts were ringing In the key that our souls were singing As we danced in the night, remember How the stars stole the night away..."
@Mariana M.: Hi Mariana,. Actually you are right, I did not do a whole lot with this other than highlight and some tones etc ..I DID have to try and brush out some pesky wires and a pole that is gone now but the blur is still visible...If I had really taken more time I probably would have done a slightly better job but I still loved the feel of this scene that morning when I came upon this...Thanks very much dear friend!! @Mariana M.: :-) You are too funny :-) Thanks again Mariana.. I always have loved this song, and you know what ? I'll put the CD now as i pack for my 3 or 4 days lil' break ;) September fits your gorgeous image so well ! This is a masterpiece! The light is stunning and I like the layers of shapes as we move back through the frame. Congratulations on this outstanding photo. @GJC: Hi GJC - Wow, thank you so much ;-) I regard your work so highly, this is truly a wonderful compliment - all the best sir!! a painting. I believe I have seen such work from you before and it is most beautiful, Denny. @Phil David Morris 2011: I love it Phil..."Day of The Triffids"..:-) a crack up...Thanks so much Phil - I really appreciate it..Sorry I have really been helter skelter the last few months,,,but I missed hearinig from you so it is great to reconnect..my apologies!! Wow, just wow! I can't believe you've been sitting on this photo - what an absolutely marvelous and beautiful image Denny. You composed and shot this so perfectly. Excellent work my friend! @Jason Politte: And you know what, I actually thought I had posted it before and was checking and re-checking last night to make sure...I can't remember what it was that I had that I swapped it with one day a few weeks ago, but thank you very much, Jason! I really do appreciate your comments....To gauge my shots, I always like to compare the number of unique views versus the number of comments... and usually, if I get about 50% comment to view ratio I am very pleased...But this one seems to be touching people quite nicely so far, and that means all the world to me just to see and know that people like it...so thank you very much sir!! Very nice and creative shot, love the color. Deluxe atmosphere, Denny! A real eye pleaser. I adore that little highlight on the distant silo, too. Be proud of this one, sir. Absolutley beautiful, Denny! It hasn't been dry here in weeks, too much moisture...I look forward to days like your photo! Oh my! What a fabulous atmosphere in the image. Really a wonderful photograph to contemplate for very long. Great job, Denny. @Francisco Romero: Hi Francisco - Thank you very, very much, sir...I really appreciate your kindness!! So beautiful. Wonderful atmosphere. 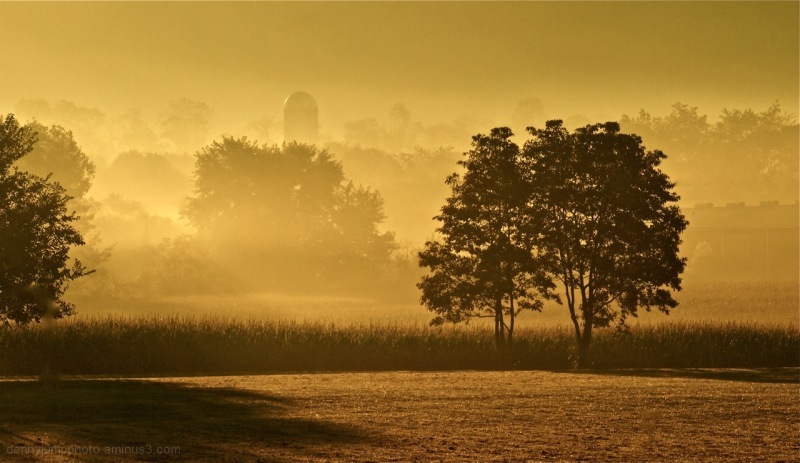 Great capture of this brilliant golden sunlight through the morning mist. @Sam: Hi Sam - Thank you so very much, sir! oh wow, i stand at attention, full of admiration for this GORGEOUS image, denny! the title and the processing are 100% effective and convincing - what a wonderful atmosphere! The little miracles of some early mornings light. The feeling we have an unique and exceptional chance when this happening. Great tones, gret contrast, great picture. @Ainsley: I completely agree, Ainsley. I try to have my camera with me in the car every day when I travel to and from work...the morning is such a great time to take shots ..Thanks you sir! Oh what a stunning capture here! I love the golden tones here, the sunlight and how the background slowly fades into the fog. The silo makes a great standout in this compo. @Céline: Hi Celine - Thank you so much...I have really been enjoying your continued iimages...so poetic and enchanting and totally mesmerizing - I love them! Hi Denny, This is gorgeous! I am looking forward to seeing the sun again. Maybe by Friday they say! The light here is absolutely amazing! @Elaine Hancock: Hi Elaian - Thank you so much..aren't you tired of it ?!? We are having flooding rivers AGAIN up here....Good Lord!! Nice tones, great feeling to this one. Denny this is such a beautiful scene. The 'weather Gods' have seen to it that we have had plenty of rain here, every day, (thanks weather Gods). I have been really busy, in a good way, but have not had much time to leave comments, for this I am sorry. I am sure Barbara's Mom is quite pleased looking down from that box seat in the sky! @Judy aka L@dybug: Hi Judy -I really want to thank you - so very kind of you to say...AAll the best!! beautiful morning! i love the golden tone and the soft light! they really make for a wonderful mood and you captured it very well! @DarkElf: WOw thank you very much sir, I really appreciate all of these wonderful comments I have receievd on this one...I am truly honoured..thanks again!! Wow, that is one gorgeous, gorgeous, gorgeous shot. I am blown away! @Bettina: Thanks so much, Bettina...youa re the best - wish I could reach across the miles and give you a hug ! Cheers, kiddo! I'm lost for words Denny, you really have produced an epic glorious image here, worth my five stars! @Curly: Hi Curly - WOW, thank you so much! I am really flattered and totally honoured by the very kind comments I have received the past few days regarding this shot...maybe I better quit while I am ahead and just leave this up here :-) But seriously, thank you very, very much, sir!! Denny sorry I missed this one yesterday. The light & colour are stunning, a masterly multi layered photo sir. @Williams: Hi Paul - No sweat brother - thank you very much for your really kind comment....I do appreciate it - it is ALWAYS so wonderful to hear from you my friend..I titally loved that image of yurs today - just wonderful!! Wow Denny - I can see why this image is getting so much attention. Perhaps a SPOTLIGHT would have been merited! The light is incredible - love the feel and composition of this image. Thanks so much for your kind support yesterday. Every once in a while somebody wants to rattle my chain. This could be anyone as we have no way of knowing who is viewing/commenting on our images. It felt nice to have not only your support but the support of many regulars here on Aminus3. Have a fantastic day and keep up the excellent work. Next time you get out on the left coast - give me a call! @Don Smith: Thank you so very much, Don! This is, indeed, an honor and I really appreciate your kindness. There are so few unselfish ones like you around, that it really bothered me yesterday. An old Vietnam era pal of mine and I like to joke about being "unstable combat vets" and that's what I was yesterday...actually i was pretty controlled. Not at all like the normal "go with the flow" Denny that the world knows ;-) I am with you, hatred has never been in my DNA. I know we have never shaken hands but I just want you to know how much I appreciate all that you do for all of us... and, one day, I will definitely pester the leaving daylights out of you in person - if nothing else other then to buy you a venti Pike Roast!! Thanks Don...you're the best! Wow! this is so gorgeous....that light is absolutely breathtaking! @Tracy: Hey Tracy - Thanks so very much, I really appreciate it! This piece is surprising me, I will be honest...I loved it from the moment I witnessed this scene - caught it on the way to work one morning, as usual, so I rarely have the really "proper" time to set up and compose..often times I just do the best that I can with the time and tools that I have because I just love taking the shots....One of these days, Good Lord and Knees willing, I will actually have "time to MAKE time" to take a decent picture in terms of onsite preparation...until then I will just make like John Candy states in "Planes, Trains, and Automobiles" when he said "I go with the flow like a twig on the shoulders of a Mighty stream!" Thanks Trac...all the best, kiddo!! A fine landscape with rich colors and details. The haze or fog gives the shot a wonderful mood… very appealing image. @Calusarus: Thank you very much Calusarus!! DJ this is another beauty...love that foggy misty gold light! Ver nice!!! @Nina: Hey Nina- Thanks very much - Yes this one seemed to strike a cord with a lot of viewers - I was very pleased and proud...thanks kiddo! Denny...Don't know how I missed this one...Awesome color, tone and a very nice country scene ! A spectacular photo, Denny. That golden light is sweet. While I've been gone you've become a master of light. Love the golden mood here Denny! Great! @Digital Sojourn: Hia nd thank you so much for your kind comment. I appreciate this greatly - your images are fantastic! !